Over the last few weeks, I have come across 2 online resources which I feel could be really useful in my future teaching career. These have been shown to me by university lecturers, and in the spirit of sharing, I thought I would write a little post about them to hopefully inspire some of my fellow course-mates. The first of these resources was comes from the website ‘Chrome Experiments’. This is “an online showroom of web browser based experiments… and artistic projects” (Wikipedia.) In other words, people have been creating all kinds of weird and wonderful things and uploading them to share with the world. The particular experiment which appeals to me and that I can imagine using within the classroom, is Chrome Music Lab. Within music lab, there are various different activities, all connected with music. For example, the first activity (entitled ‘Rhythm’) you can experiment with having the characters beat their drum (or ting their triangle, or knock their wooden block…) at different times according to where you place a marker. This is a great introduction to simple rhythm and patterns, it also gives children a very basic, first introduction to how music can be represented on a page. 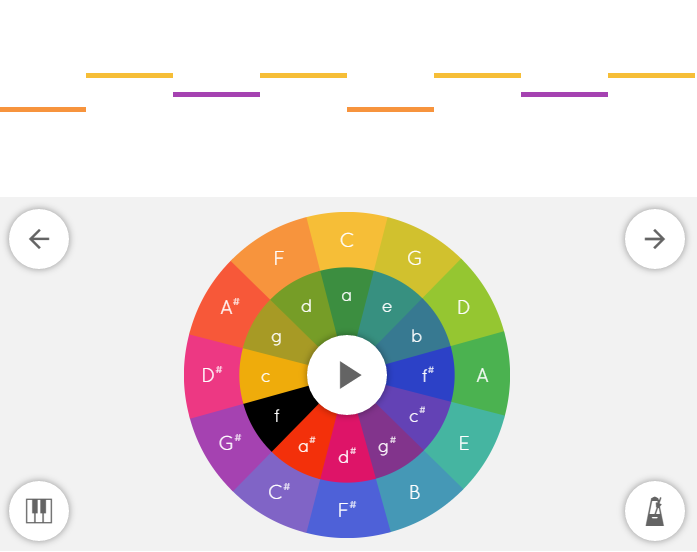 Another part of Chrome Music Lab is ‘Arpeggios’ . Here you can click on any letter to hear the arpeggio played in that key. You can also adjust the speed in which the arpeggio is played. I think that this could be a great tool for looking at how music can be used to provoke feelings and emotions – for example, the arpeggio in d#, playing at a slow tempo could be perceived to sound slightly sad/ melancholy whereas playing in G, at a faster tempo may sound happy and joyful. The second resource was introduced to me through a TDT task which was sent earlier today. Again, I’d never seen it before, but it got me quite excited and I just had to try it out. Padlet is a virtual space where you can add ‘post-it’ style notes, as well as photos, links and media from your own computer or from the web. What I really like about it is that it can be used as a collaborative space. Each board can be set to be private (for your eyes only), public, or password protected. This means that it could easily be used for students to work together on a project – collecting their research or sharing ideas together. HERE is my example Padlet board (pictured below). To access it you will need the password: uodedu. Feel free to add/ remove/ change things if you would like to. Having this information stored in a secure online space means that pupils could continue to add work or ideas to it outside of school hours if they so desire. It is also attractive (customisable backgrounds and icons) and easy to use, which may help to engage the children. THIS article from Education World has some more ideas about how you might use Padlet within the classroom. I particularly like the idea of having a question wall – with children perhaps adding questions about what they are currently learning and showing any gaps in their understanding, or perhaps adding questions which show what they would like to learn next. Of course, an issue with this is that not all children have access to computers or the internet at home. Therefore I would not use a resource like Padlet for any homework tasks or compulsory work unless there is time allocated to it within the school day. Within EY, I could see Padlet being a useful tool for sharing ideas, planning and CPD. A team could work together on building up ideas for a play and learning. Being a visual person – I love creating mood boards for a new area of learning! I always love discovering new resources and I would urge you to have a play with these. Let me know what you think of them in the comments below! Following the wonderful experience of hosting the #ScotEdChat last week, I was reminded of the potential of Twitter as a resource for professional discussion and CLPL. However, I am aware that some people find Twitter to be overwhelming and are not sure how to make the most out of the experience. For that reason, I have decided to make a little guide which I hope will encourage others. will it be a personal account or a professional one? Or perhaps a mix of both. which image will you use? An appropriate picture of yourself or a picture which represents your field of work will encourage other Tweeters to engage with you. don’t forget to add a little bio, telling others a little about yourself. This helps when others make the decision whether to follow you as they can see any shared interests or themes among your Tweets. It sounds a little creepy, but following other people on Twitter means that their Tweets appear on your ‘home’ feed. Here you can see all Tweets relating to the subject that you have searched. Clicking onto ‘Accounts’ will allow you to see profiles of people who Tweet about the subject. Once you have started following a few people, Twitter will begin to make suggestions of similar profiles which you may be interested in on your home feed. Circled here, you can see the suggestions of profiles which are suggested for me to follow. These ones in particular have been suggested due to the people which I currently and recently follow. ‘Tweets’ are short (140 character) posts. Being able to say what you want to in such a short space is a bit of an art, but you’ll soon get the hang of it! You might want to Tweet about an interesting article you’ve read. If so, why not add a link to that article and allow others to see it too? Just copy and past the url into the Tweet! If it is a long link, you may want to shorten it using the handy tool Tiny Url. Retweets are when someone shares a post that someone else has Tweeted, making it available to their own followers. You may also choose to add your own comments to the retweet, sharing your own thoughts on a matter. Replies work in the same way has having a conversation with someone. An @ sign will appear before your name or the name of the person that you are Tweeting to. In the same way, someone may mention you in a Tweet by adding the @ sign before your name. When someone retweets your post, replies to you or mentions you in a Tweet, you will receive a notification. These appear in the banner at the top left of your page. These are messages which are not available publicly. You may want to use these for making arrangements or sharing information HOWEVER, (as with all social media) I would strongly advise against sharing personal details such as phone numbers, your address etc with unknown others. Hashtags are a way of grouping tweets and conversations under a similar umbrella. For example, if you were tweeting about education, you may want to add the hashtag #education or #teaching. This means that when these terms are searched – your tweet will appear. Hashtags are also used in Twitter chats. These work as everyone involved includes the same hashtag at the end of their Tweets – grouping them all together in a list. For example, during ScotEdChat, everyone used the hashtag #scotedchat on each of their Tweets. Following a chat can be difficult as they are often quick moving and very busy. A nice way to keep on top of it is to use a tool such as Tweetdeck. You can sign into Tweetdeck using your Twitter login details. You are then presented with columns which include your home feed and notifications. You may add columns with follow your searches (the hashtag for the chat) and this will then update in real time, allowing you to see the most recent Tweets in a list. Here is a nice little guide to getting started with tweetdeck. #EYTalking (This is a place where early years professionals share ideas, advice, successes and challenges. Loads of brilliant links are posted for professional reading. The chats are not weekly, however they are worth watching out for as they cover brilliant topics such as planning and outdoor learning). #kinderchat (This chat takes place on Mondays from 8:30-9:30. There is a helpful calendar HERE which lets you know the topic of the next chat). #EYshare (This is the chat which I host. It takes place on Wednesdays from 8-9pm and we aim to provide a friendly place to discuss a range of topics related to early years education and childcare). I hope that this little post has got you feeling a little more confident about using Twitter as the fabulous resource that it is.